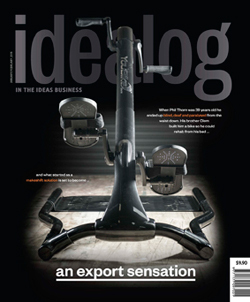 Six time winner of New Zealand Magazine of the Year, Idealog is New Zealand’s premier business ideas, innovation and creativity magazine. We are proud, honoured and somewhat humbled to be recognised by New Zealand’s leading business publication. YouBike’s journey has been a long and rewarding one and we look forward to sharing it with you. We would say more, but we don’t want to spoil the surprise. Grab your copy today! Our very special thanks to Idealog editor Hazel Phillips and her talented team. Download the full story From Heartbreak to Heartbeats. Originally designed for exercise following a spinal cord injury, YouBike™ is a multipurpose cardiovascular exercise bike which be used by persons recovering from a stroke, MS or Parkinson’s. YouBike™ can be floor mounted and used with or without a wheelchair or in a bed to exercise the arms and legs. YouBike™ is lightweight and suitable for rehabilitation units, physical therapists or any person requiring safe and effective exercise at home. © Design Imagineering Ltd 2013-2016. All Rights Reserved.